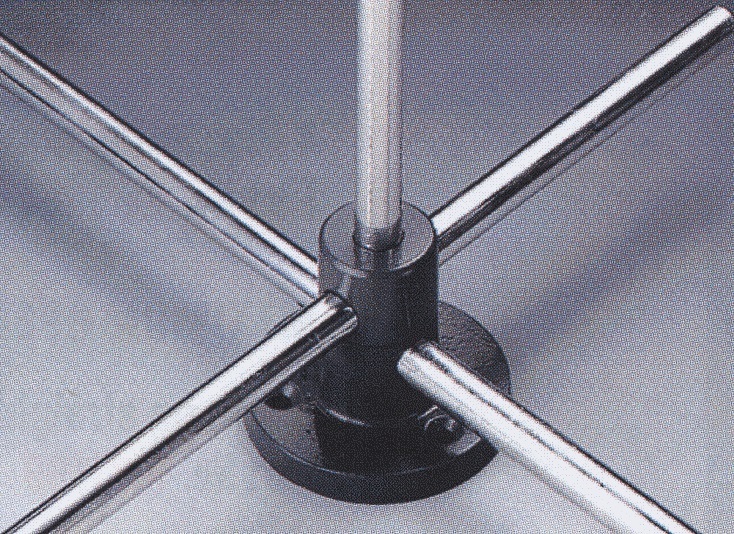 A large variety of bases, stands and supports that can be used with standard Bosshead ,Type P or Trevinge clamps to build a solid structure for support of laboratory equipment and instruments. 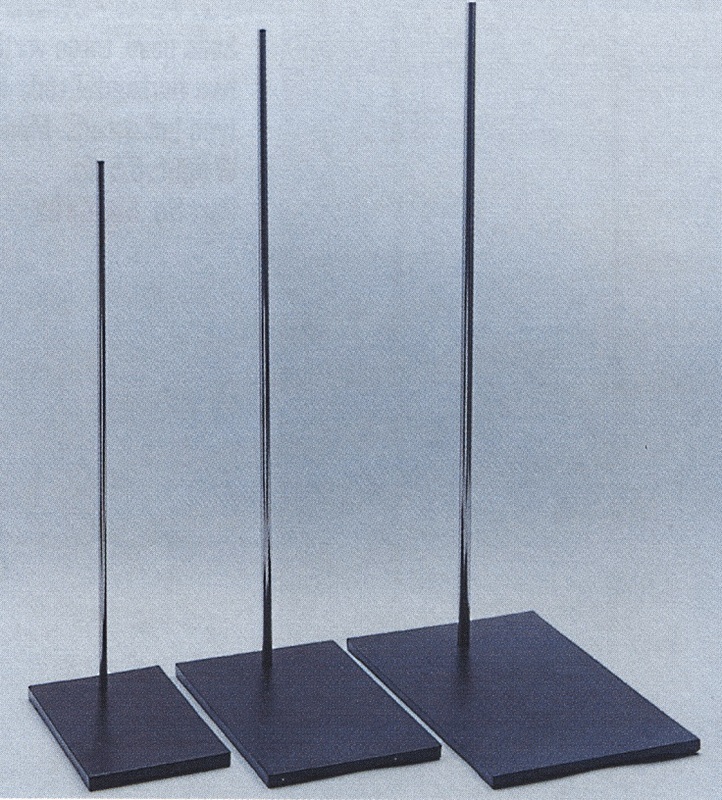 6000117 Burette stand with AISI 304 stainless steel rod of 10 mm diameter, 600 mm high, weight 2 kg. 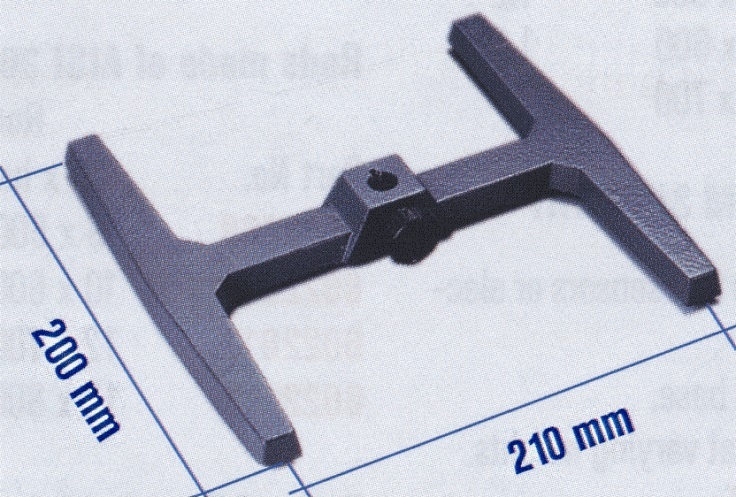 Made specifically for the Duplex burette clamp (Catalog number 7000181) with two plates at the base, black and white. 1000050 Universal mounting base, suitable for mounting and supporting horizontal and vertical bars, 250 × 110 mm. 1000049 Mounting base foot support for horizontal bars of diameter 12 mm. 1000101 Mounting base foot support for vertical bars of diameter 12 mm. 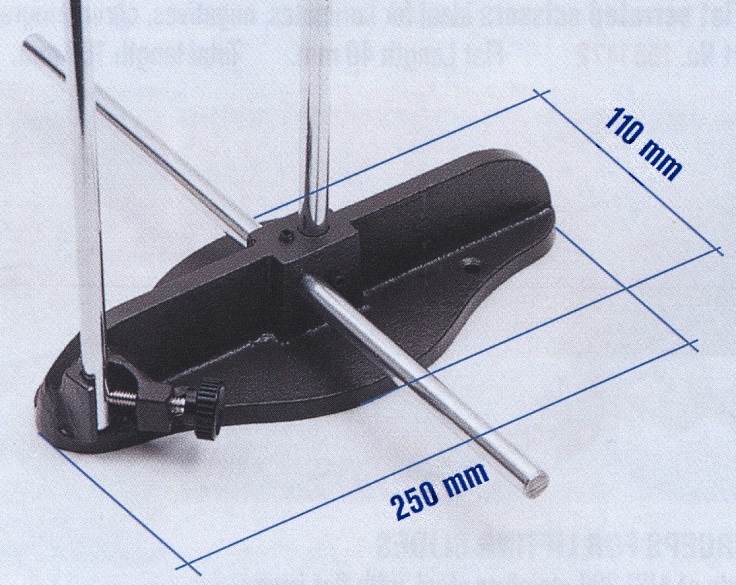 1001102 Mounting base foot support simultaneously for horizontal and vertical bars of diameter 12 mm. 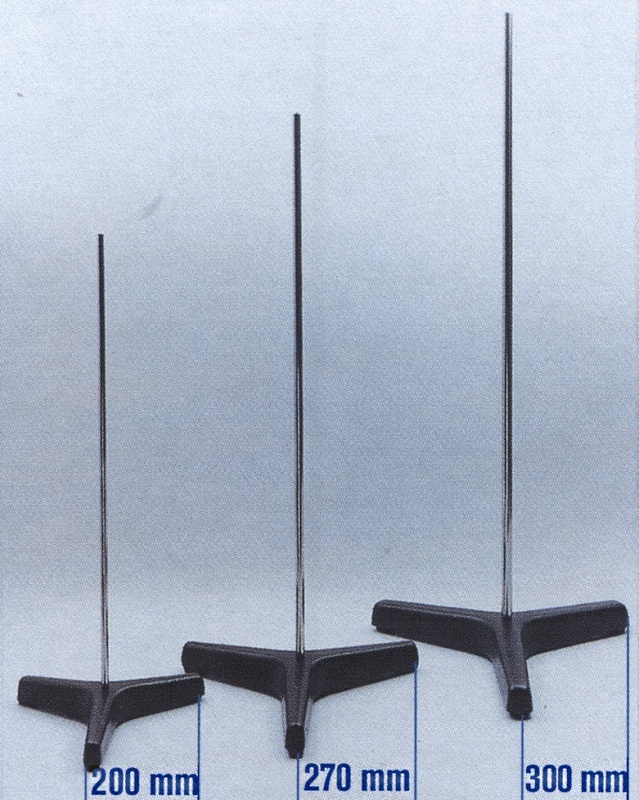 6000046 Central rod retort stand, vertical rod of Dur-aluminum with diameter 10 mm, height 600 mm. 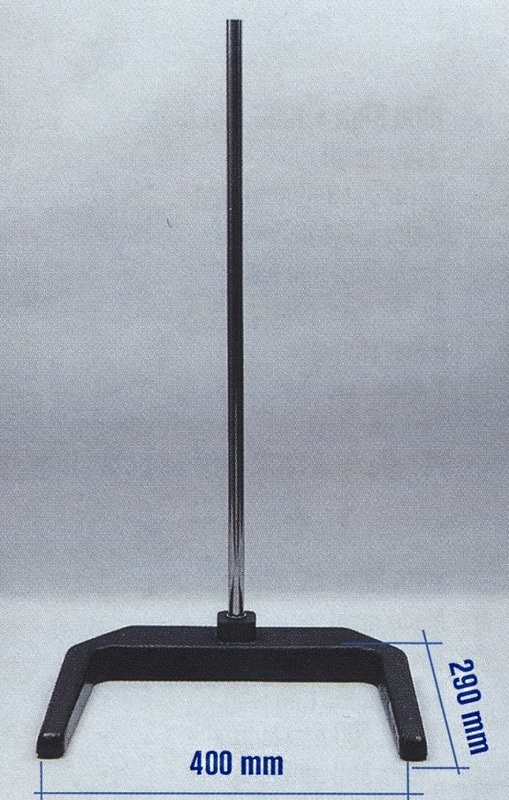 Base 315 × 200 mm, weight 3 kg. 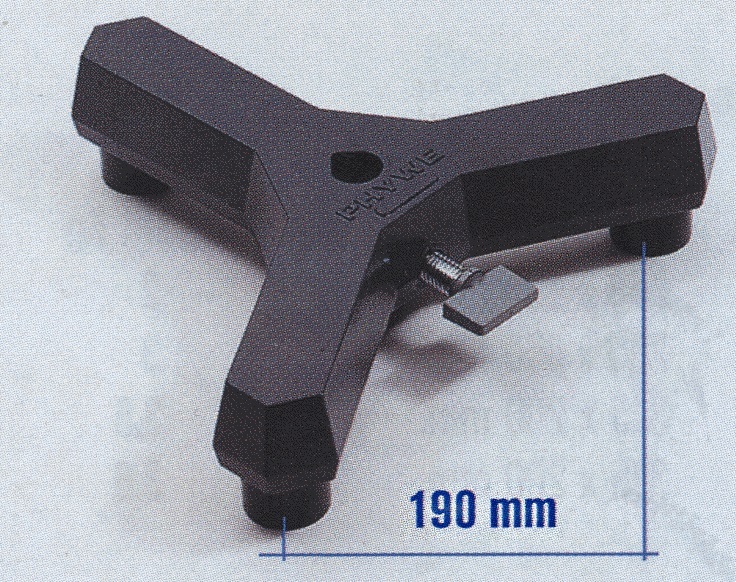 6200255 Tripod support Pass, original Phywe, base with leveling screws to support square and round rods from 6 to 14 mm in diameter. Weight 2 kg. 6001103 H shaped Double base support T Mini, small foot support with screw clamp for removable rods of 8 to 12 mm diameter. Footprint 200 × 210 mm, weight 1.2 kg. 6002278 Tripod support stand, AISI 304 stainless steel rod, diameter 8 mm, height 500 mm, weight 1.4 kg. 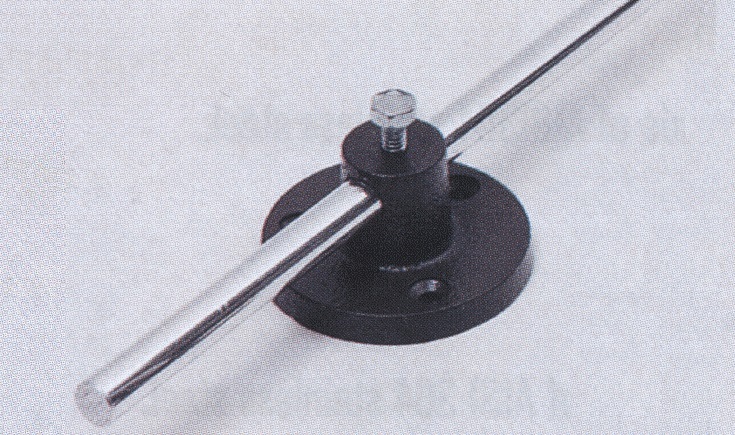 6000798 Tripod support stand, Dur-aluminum rod, diameter 8 mm, height 500 mm, weight 1.2 kg. 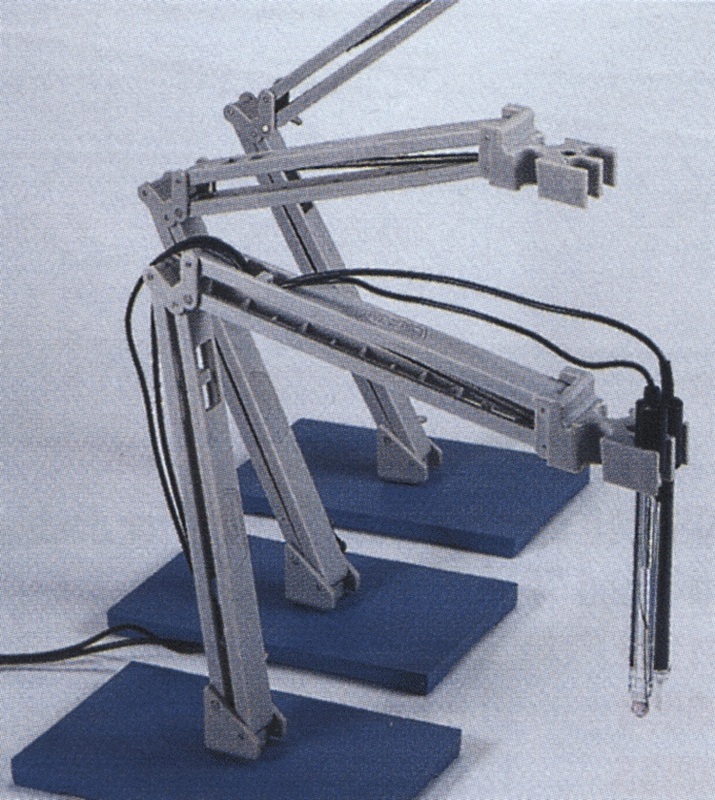 6002268 Retort stand, conforms to DIN 12892 standard. Rod made of AISI 304 stainless steel. Rod diameter 8 mm, rod height 500 mm, Plate size 200 × 125 mm, Weight 2 kg. 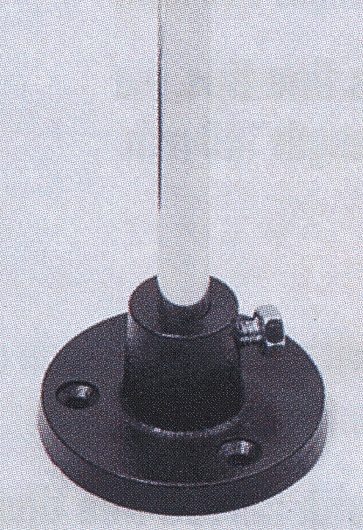 6000778 Retort stand, conforms to DIN 12892 standard. 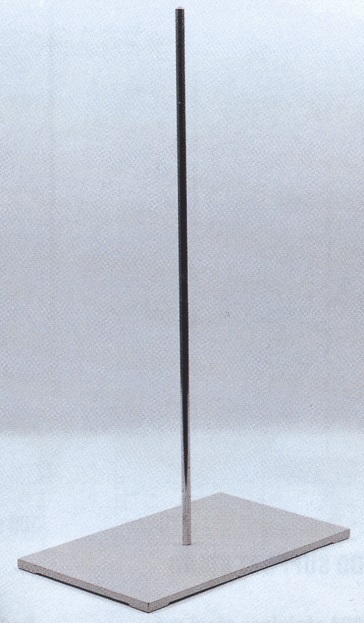 Rod made of Dur-aluminum. Rod diameter 8 mm, rod height 500 mm, Plate size 200 × 125 mm, Weight 1.4 kg. 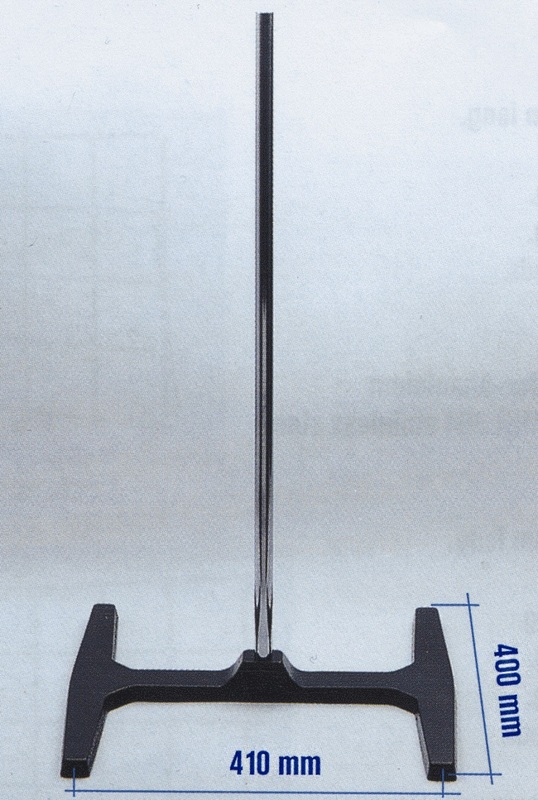 6000411 U shaped support stand made with rod of AISI 304 stainless steel with diameter 20 mm and height of 800 mm. Very stable with a weight of 7 kg and footprint of 400 × 290 mm. 6000410 H shaped Double base support stand T Maxi, made with rod of AISI 304 stainless steel of diameter 20 mm and height of 800 mm. Designed to support weights of up to 20 kg at 300 mm height from the base. Weight 7 kg, footprint 410 × 400 mm. 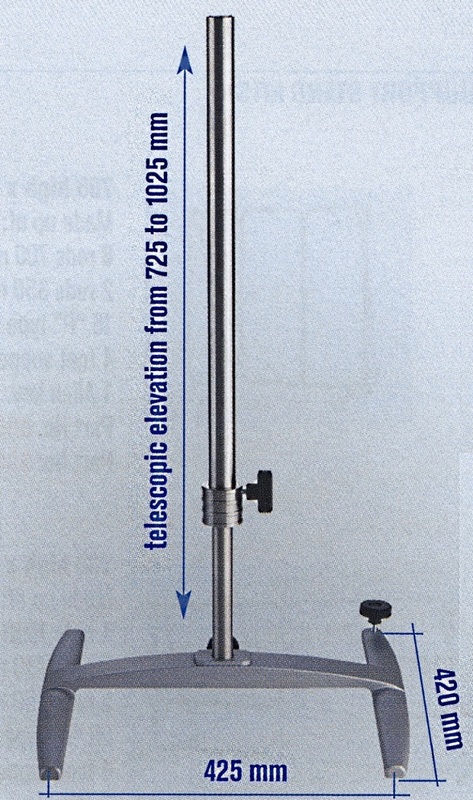 5057011 H shaped Double base support stand T Telescope, AISI 304 stainless steel base, rod of diameter 32 mm and height telescoping from 725 to 1025 mm. Maximum support weight 20 kg. Weight 7.7 kg, footprint 425 × 420 mm. 1001552 Universal arm support, with holder for up to 4 sensors or electrodes, Very stable heavy base, ideal for working at varying heights.